Minnesota residents can register their vehicles with the Driver and Vehicles Services. License plates are required for most vehicles to drive legally on state roads. There are various plates available such as specialty plates, disability plates, and vanity plates. You can register your vehicle with the Minnesota Driver and Vehicle Services (DVS). New residents must register their out-of-state vehicles within 60 days. However, if your vehicle’s registration is about to expire from the previous state, you must register right away. If you’re purchasing a new vehicle from a dealership, most dealers will assist with the registration of your vehicle. You’ll be provided with temporary plates and can drive legally until your plates have been processed. Note: Anyone who has moved to Minnesota from a different state must also obtain a Minnesota driver’s license. When applying for your license plate, it is possible to choose from various license plate styles. Minnesota’s standard license plate has a blue and white background with blue lettering, the state’s emblem, and “10 000 lakes” across the bottom. You’ll receive this plate if you don’t make a special request for other styles available. Note: Before registering your vehicle, you may require temporary license plates in Minnesota to drive legally from the point of sale, to your home, and the DVS office. You can apply for a specialty license plate in Minnesota which has a unique design and represents a local charity, organization, or cause. Personalized license plates allows you to create custom plate numbers for your vehicle. You should look up available plate numbers online before applying. Be sure to follow the guidelines by the Minnesota DVS to ensure your personalized plates are approved. If you have a disability you may be eligible to receive a placard or license plate for your vehicle. This special license plate enables you to park in designated parking spots for people with disabilities. Be sure to bring the necessary documents when you apply for these Minnesota license plates. Before the registration stickers on your rear license plate expires, you should renew your vehicle with the DVS. It is possible to renew your stickers online, in person, or by mail. You may receive a notification in the mail before your stickers expire. If you don’t renew your vehicle’s stickers before the expiration date, you may have to pay late fees when you get around to renewing them. When you move to a new state, you won’t have to surrender your license plates. However, if you sell your vehicle before the registration expires, it is possible to apply to a refund. You must surrender your license plate if you intend to receive a refund for your vehicle’s registration. Contact the DVS for more details about transfering plates to a new vehicle. If your plates were stolen, you should contact the local authorities and file a report. In addition to any of the above fees, you may also be required to pay state tax, titling fees, and other fees related to vehicle registration. 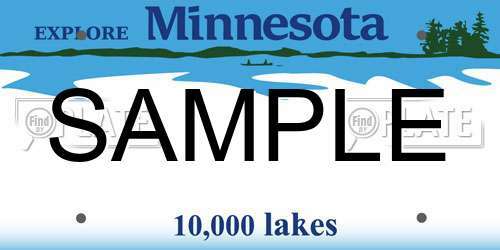 If you are considering applying for a personalized license plate in Minnesota, you should look up available plate numbers online. Simply submit the plate number you want in the relevant state and hit submit. Be sure you are following the guidelines provided by the DVS for personalization.